First U.S. Tobacco-Related Lawsuit April 1808, Com v Colquehouns et al. Slavery and the Slave-Trade . . . .
Count Leo Tolstóy's 10 June 1890 Why Do People Intoxicate Themselves? Pathology: A Study in Birth-Rates. gunfighters still shooting Yankees, click here. lest they vote to allow blacks to vote. 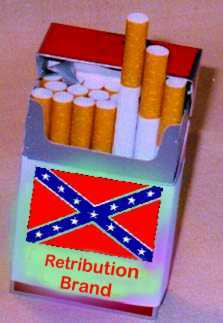 A Better Warning Label: Treat cigarettes like you would a live hand grenade, throw away as far and as fast as possible. Save yourselves and those around you. “Public health is the foundation on which reposes the happiness of the people and the power of a country. The care of the public health is the first duty of a statesman.”—Benjamin Disraeli (1804-1881). “Partem aliquam recte intelligere nemo potest, antequam totum, iterum atque iterum, periegerit.” No one can rightly understand any part until he has read the whole again and again. Meaning: Re-read referenced sites, “iterum atque iterum,” “again and again,” until you understand them in full.